I thought about starting this to show the before and after shots of our restoration work, especially as SpaceDuck is now starting to re-tolex his Rhodes I thought it might be a good idea. Plus it would be useful to put any tips for future work. This I bought in a bit of a sorry state as you will see, the eBay seller described the inside as good and with a slight bit of corrosion on the tines and tonebars! It cost me £600 and an extra £100 for the lid as he initially didn't want to sell it with one. It had deep scratches on the harp cover, red wax on the keys and lid and white paint all over it, no legs/braces or sustain pedal & rod, I was happy though! what did you do against the rust ? The harp frame I sanded down using a delta sander for a nice even finish which completely removed the rust. I then used a grey primer and added roughly 7 or so coats of gold to give it a good level of protection. In between each layer I lightly sanded it down to smooth out the finish. The pickups I used an ordinary dremmel, there was so much rust on them by the 73 note there was nothing left of the wire brush! The tines, I sanded down using fine sandpaper and the tone generators I initially used the wire brush of the dremmel (what was left of it) to remove the white oxidisation but some of the tines required a bit more effort so I used some fine sandpaper on the sander, the end picture is a perfect example. The tonebars however need a proper acid bath and re-plate so instead I purchased a clean set off eBay off a MK1 88 key for about £40. My plan is to sort out the existing tonebars and probably sell them on. Oh well, your resto looks great! Here's the before pic. It looked pretty decent, but needed a few tweaks. The tolex was ripped in a few areas. I told myself I was just going to work on the inside stuff, but lost control pretty quickly. The lid had wax all over it so I decided to sand and repaint. I was in the zone while doing the tolex and grillcloth, but I managed to snap a couple of pics with my phone. That suitcase just looks superb, when I first saw it about a month ago I wasn't too sure about the crocodile tolex but now I love it! It definitely works. Did you coat the gold paint with a varnish afterwards? I'm impressed at how much you managed to sand down, it looks as if you built the lid and box yourself. I went back and forth on the croc tolex, but I'm glad I got it. It is quite a bit thicker than the original and a little tough to work with, but it is amazing up close when finished. I did use a clear varnish over the gold. I let the paint and the varnish cure for 1 week each. It still didn't turn out like I had hoped, and it is coming off in a few places, but I still think it looks better than the old stuff that was on there before. Someone should really manufacture brass hardware. Also, I highly recommend the backcheck mod. Question to those who've been doing restoration: Where can I find black chrome hardware (not matte black)? I'd like to redo my Rhodes MKII and have been looking for black chrome hardware but haven't been able to find any yet. Any info would be greatly appreciated! thanks! The only option I could Imagine is getting a local company to chrome it for you, but that would be very expensive. I don't think anyone manufactures them. A good chrome shop should be able to handle the latches with no problems, but it will cost you. I did a pretty extensive search for gold hardware when I was restoring my Rhodes, but ended up just using spraypaint. ^Thanks! I was on the fence about the orange(it was supposed to be a darker, metallic copper), but I'm warming up to it. I have access to a Dremel and was thinking of using it to remove some rust/corrosion on my MKII pickups. Did you just leave the pickups in place? Also which wire brush did you use? I took the entire harp off the piano, removed the tonebar rail from the harp and left the pick-up rail in situ to save all the hassle. But then spent most of the day avoiding the stray wire which would come loose and propel itself into me. So avoid it if you can, but if you can't wear some thick clothing (more than a t-shirt) and some goggles! Once I finished cleaning the pickups with the top wire brush they looked perfect. Oh and make sure you've removed any filings left over afterwards, the magnet will hold onto it and you increase the chance of them shorting out when you power it up. So either use some compressed air or go over them with a cloth or brush and make sure nothing is left on them. Great thread!! The information & especially the pics are really inspiring. It's been almost a month since I started re-tolexing, and all I've got done is the lid I ended up spending weeks trying to glue the cracks, fill the chips & straighten the warped wood. It probably would've been quicker if I had just rebuilt the whole chassis from scratch, but I'm glad I stuck with the original stuff for the sake of keeping it authentic. The tips here & in the other thread about tolex were really helpful, and I haven't made any mistakes so far. Drcarver, that's a great job you did painting the plastic cover. It looks like you got the "leather" effect on the gold top. I remember an old thread where someone mentioned using a hair dryer somehow. Is that how you did it? Hardware: I also tried painting my hardware (silver), but the paint keeps peeling off. Would a clearcoat help? What other options do I have? Since I don't have the budget to get it chromed, I was thinking I might try removing all the paint, then sanding & polishing the hardware with this Ryobi compound I got at Home Depot for $3. Has anyone tried that? For the lid, I just gave it a light sanding and painted. The plastic has the "leather" look to it, so when you paint over it, the paint will take on the same shape. I did 2 coats of primer, 4 coats of color, and 2 coats of clear. I used a fairly expensive automotive paint from a company called Alsa, and am wondering if I could have gotten the same results with krylon for the color. The clear was a 2-part formula that hardened quickly and really turned out nice. I also painted my hardware, and it is flaking off just a little, but not really that noticable. I sprayed the gold, let it cure for a week, then sprayed a clear laquer and let that cure for a week. It is pretty strong, and definitely cheaper than a chrome shop. For some reason though, the varnish took a little bit of the shininess out of the gold paint, but it doesn't look that bad. For the hardware, I used krylon products. sorry for story report in Italian there. Wow what's going on with that tine in the last image!! I can't wait to see photos of it when all the rust has been removed etc. Hey cool, I'm glad this thread has been bumped up. I need some inspiration! solyaris, that's how the inside of mine looks. Everything's there intact, but there's a lot of cleaning to do. The outside looks great in those 2 pictures. Did you do that yourself? My Rhodes has been sitting on the dining room table since the last time I posted in March. The new tolex looks great, top & bottom, but now I need to do something about the hardware and I'm dragging my heels. that's how the inside of mine looks. Everything's there intact, but there's a lot of cleaning to do. The outside looks great in those 2 pictures. Did you do that yourself? * honestly, is my new camera and a lucky light that generated this apparently perfect oustide ... indeed the piano is not clean at all also outside. BTW. could someone give me the lenght of original legs (closed) thanks! I think I ask a lathe turner to build this in a simpler form (no telescopic). * Luckly I have the sustain pedal! brocken but I guess I could repair it. I saw somewere that damper rail have been grounded ... maybe a compelete grounding wire will help ? * Last but not least, tuning is not so trivial ... I used a guitar electronic tuner and do some regulations moving springs ... it happen that some notes appear slightly out-of-tune and a small spring regulation rebring in tune the note, BUT for certain notes, the tuning is very instable ... probably a bad tine oscillation ? ... I'll investigate. * Probably the vintagetube suggestion to substitute all grommets is right for the correct vibration of tine/tonebar .. I guess I'll do this. * About escapement, probably this is one of last point to verify because all before must run corrctly to do the right voicing regulation. I happen to have my Stage legs and a measuring tape right here. The rear legs are about 27" (68.5cm) including the 1/2" thread at the top. The front leg is slightly longer, about 27.5" (69cm) with the telescoping part pushed in as far as possible (see pic). I had that problem, too. I tightened the grounding screws at both ends of the black wire & re-soldered the red wire at the jack (on the harp), and that fixed it. I'm not good with electronics, so I can't suggest anything if it's a dead pickup. Maybe you'll be lucky, and it will be easy to fix like mine was. Good luck with the rest of it! Maybe someone else can give more advice. Hi Spaceduck, thanks a lot for your help. very kind of you for detailed info! and congratulation for the unit of measurement in octaves! 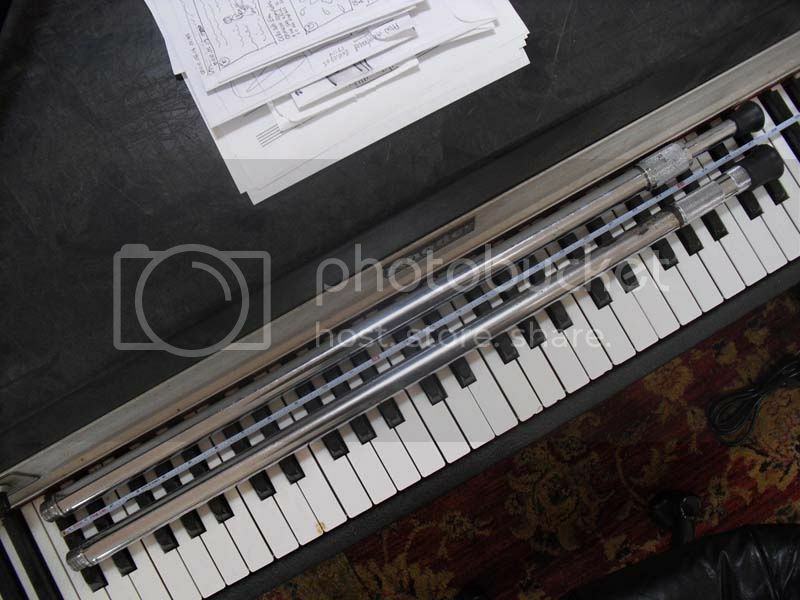 just a last question if I'm not too boring: whit the legs mounted on the piano, what is the lenght (approximately, in cm) between the floor and the piano bottom layer (the flange), with with the telescoping part pushed in as far as possible as in your pic ? I had that problem, too. I tightened the grounding screws at both ends of the black wire & re-soldered the red wire at the jack (on the harp), and that fixed it. Just to clarify is the damper bar grounded? best thing to do is to power up the Rhodes listen for the static then touch the damper bar with your hand, if the sound disappears then it's a grounding problem with the bar. It won't be too much of an issue if it isn't that so we'll get it sorted soon. Just to clarify is the damper bar grounded? no, I mean not with a wire as in the photo I attached. best thing to do is to power up the Rhodes listen for the static then touch the damper bar with your hand, if the sound disappears then it's a grounding problem with the bar. you are right , I'do the test! I decided to bring back this thread, I was curious to know how did spaceduck and solyaris get on with their restorations? I'll start adding in mine on Sunday. in facts I finished fase II restauration of my stage piano! At the moment I'm satisfied by the result! generally every one of 73 notes sound pretty well now. please note I'm note a pianist, just a big lover of rhodes hypnotic sound ... possibly matching my music view ( http://solyaris.altervista.org ). 2- and some problems here and there on the middle octaves where some very "hitted" seem to be affected of what I have see descibed as "exausted" tines syndrom ... possibly I'll detail this "minor" problem here in future. and I thank you VINTAGEVIBE Video and all helped me here in this forum!! the last weekend I tolexed a rhodes for a customer. Look at the pictures. It's not real Tweed. It's just Tweed-Vinyl but it looks cool I think. Also it has new hardware, new hammertips and new damperfelts. Nice work! it's a definite improvement, the tweed looks awesome. I'm currently re-tolexing a late MK1 which somebody had attempted to do earlier. Instead of using tolex they used something similar which has the thickness and tear-ability of paper. It's was also attached to the case using superglue making it very very difficult to take off! I'm going to have to sand it off as I can't peel any more off.